Declining polar bear weights and early breakup dates in WHB, Part I: What’s a starving bear? Posted on October 10, 2014 | Comments Off on Declining polar bear weights and early breakup dates in WHB, Part I: What’s a starving bear? 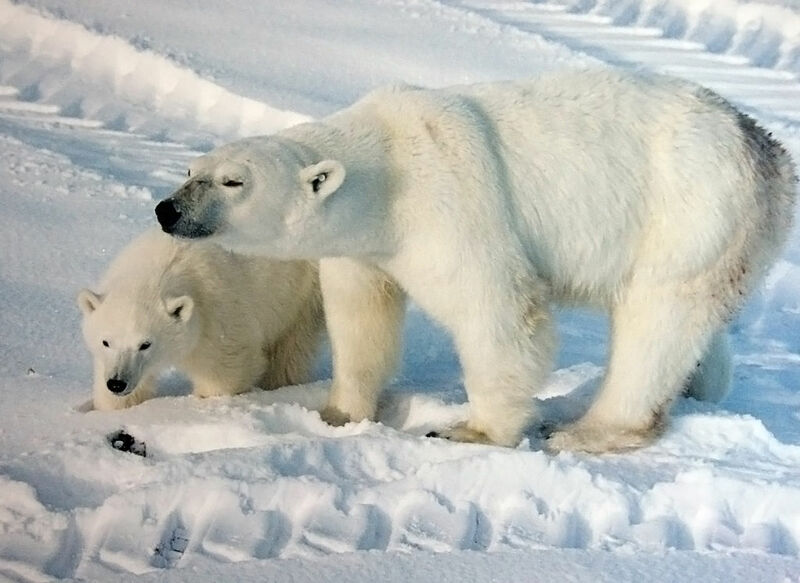 The oft-repeated claim that polar bears are starving in Western Hudson Bay (e.g., here, here, here, and here) comes primarily from a 10 year old study that documented a declining trend in polar bear body condition (a biology euphemism for relative fatness) between 1980 and 2004, which appeared to correlate with earlier and earlier breakup dates for Hudson Bay. Figure 1. Polar bear female with cub, 2009, Churchill, Western Hudson Bay. Wikipedia. 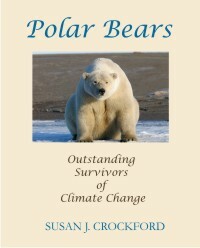 The authors of that study (polar bear specialist Ian Stirling and NASA sea ice researcher Claire Parkinson) reported the body weights of lone female bears captured in Western Hudson Bay between 1980 and 2004. The trend over time in those bear weights was then correlated with the overall change in dates of sea ice breakup on Hudson Bay for that period. However, it turns out that while the trend of body condition and the trend in breakup dates indeed correlated over time, the actual year to year data did not. The question is, what does that mean for the claim that polar bears in WHB are starving? Comments Off on Declining polar bear weights and early breakup dates in WHB, Part I: What’s a starving bear? 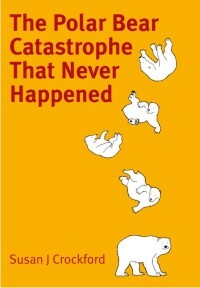 Ironically, just as I was about to remind readers that we are entering the peak period of polar bear births around the Arctic (see previous post, “December is polar bear nativity month”), I came across an article about breeding polar bears in captivity — getting the bears to give birth in zoos. 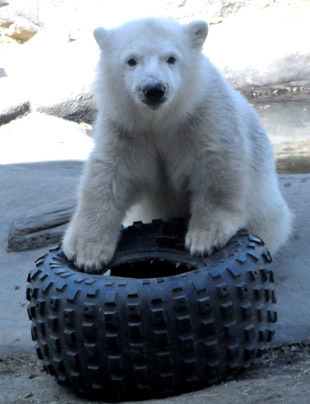 Hudson the polar bear cub is a zoo-born polar bear. He moved in January 2013 from the Toronto Zoo, where he was hand-raised after being rejected by his mother, to the Assiniboine Park Zoo, Winnipeg. The Assiniboine Park Zoo were also the recent recipients of a cub orphaned when its mother was shot after a polar bear attack in Churchill. Photo from Toronto Zoo. The newspaper article I saw was all about how technically difficult the generation of polar bear cubs has been for the Toronto Zoo (Canada) but it was the premise for the breeding program itself that caught my attention: to save them from extinction. The zoo is not waiting until the bears are down to the last few hundred (or even thousands) – no, the zoo is starting now, while polar bears are as plentiful as they have been in the last 40 years, to prepare for their demise. Polar bears are generally out of sight at this time of year and will be for several more months. Pregnant females will be snug in maternity dens giving birth and all others will be out on the sea ice looking for seals to eat – if they can find them in the dark. In most areas of the Arctic, December is when polar bear cubs are born, although in southern regions (like Western and Southern Hudson Bay), some may be born in late November and in the far, far north, a few may be born as late as early February. The actual “date of birth” for polar bear cubs is often back-calculated from when they emerge with their mothers in the spring, because they are born well away from our prying eyes in the dark of the Arctic winter, deep with a snow or soil den dug for that purpose (see previous post here). So our knowledge of the “true” dates of birth in various regions is limited. We have some evidence from native Canadian hunters prior to 1968, when it was both legal and common practice in Canada for Inuit to hunt bears in their dens (Van de Velde et al. 2003), and from a few scientific research expeditions (Amstrup and Gardner 1994; Harington 1968; Ramsay and Stirling 1988; Derocher et al. 1992). 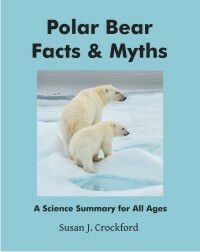 Polar bear cubs, like all bears, are born tiny and rather undeveloped (see Figs 1 and 2 below). Their eyes do not open until about one month after birth. By the time they are 63 days old (two long months after birth, see Toronto Zoo photo here ), their eyes are wide open and they are well furred. Keep in mind, for perspective, that domestic dogs are born after a 63 day gestation period and their eyes open at about 12 days.